The Great Cat of R'a explores a world of deception and the dire consequences that come of it. Shesmu, receiving the Best-Young-Chef award from the Menmenet Montupahapy Society, begins a journey through circles of deceit that ultimately threaten to destroy his career and even his life. Following the money through the twisting byways in his Egyptian home town of Menmenet on the West Coast of North America, Shesmu confronts profitable nonprofits, murdering priests, and deluded gangsters from neighboring Russkaya Amerika. At the same time, he deepens his new relationship with Detective-Sergeant Cheryl MacIntyre of the Menmenet Medjayu, unwittingly putting her life on the line with his own. 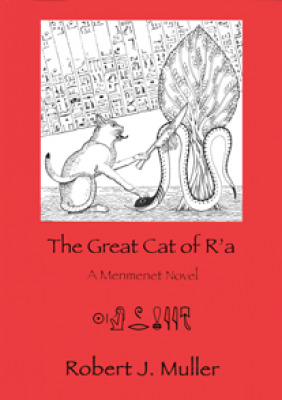 The second in the alternative-history Menmenet series, The Great Cat of R'a imagines an alternative world that combines ancient religion with modern criminality, mystery, and deceit. Robert J. Muller manages the technology behind a major genomics database by day and writes mystery fiction by night. He lives part time in San Francisco and part time in Menmenet and dines well in both cities. Mary L. Swanson is an artist and landscape architect.